A sci-fi film gem that may produce in you "a hypometabolistic state. A type of suspended animation, brought on by the contraction of the mezzentary blood vessels in the pressure change,” all as a result of simply watching it. Cinematography: John Mathew Nickolaus, Jr. US Air Force Captain Eugene K. Matthews sits at his desk in a small office at Wright-Patterson Air Force Base. He is just a minor cog within a much larger machine that has been ceaselessly grinding away for decades. The giant machine is called the Human & Extra-terrestrial Anomalous Dialogue project. Project HEAD was initiated specifically at the request of General Neil Thomas, chief of the Air Force Materiel Command at Wright-Patterson Air Force Base. The order to initiate Project HEAD came via Roger Cowpepper, Special Assistant to the President, under the title of "NCS/MJ-12 Special Studies Project" dated April 1, 1954. Many captains and other military intelligence personnel before Captain Eugene K. Matthews have been set the task of industriously beavering away at sifting through thousands of reports of human and extra-terrestrial contact, interaction, collusion and communication. Since the 1950s such reports have been collected, analysed and filed. Project HEAD has been secretly and quietly humming away in the background while more publicised projects such as GRUDGE & BLUEBOOK have come and gone. 1. To scientifically analyse the related data. 2. To determine if the reported phenomena are a threat to national security. Any data deemed to be of sufficient interest is to be immediately referred to the U.S. Air Force, the Joint Chiefs of Staff, and the National Security Council. Such reports will then be digitized, stored away and acted upon if possible. And so, as part of this never-ending “house-cleaning” project, we have Captain Eugene K. Matthews sitting at his desk with yet another manila folder containing a report of yet another historical incident of human and extra-terrestrial contact and communication. Rarely had he come across such an historically ancient case crying out to be buried under mounds of time-accumulated dust. In fact, the manila folder and its contents looked as if they had been stored away only yesterday. Under the icy circle of the white cool-glow LED light illumination of Matthews’ desk lamp, the manila folder, T-471947 is opened to reveal a 1958 Incident code-named: “Night of the Blood Beast.” This particular document, Matthews learns, was located in Record Group 197, entry 1952. A: Anomaly unexplained– Retain & classify “Top Secret” pending referral to and further investigation by U.S. Air Force, the Joint Chiefs of Staff, and the National Security Council. D: Danger & threat posed to national security. Immediate referral to President & Joint Chiefs of Staff for assessment & appropriate course of action to be undertaken. US astronaut returns from space dead. Head scientist at based killed in unusual circumstances. Base cut off from the outside world by an alien entity. Alien embryos discovered inside the resurrected astronaut's body. Body of dead astronaut allegedly used as a breeding vessel for alien life-forms. Captain Matthews has read enough of these reports to know how easy it is to get caught up by dry facts and statistics. What is important is to try to get to know the people involved, who they were, the role they played in events and what might have motivated them to act in the ways they did. Shortly after take-off, the ship was apparently struck by an object, forcing Major Corcoran to abort the mission and land. Unable to cope with the rapid descent back into the atmosphere, the Major’s ship crash-landed in the woods ten miles northeast of the space agency tracking base, killing him. It was estimated that Major Corcoran had been dead for three hours, but his body was still warm, with no sign of rigor mortis, skin discoloration, or dilation of his pupils. It was decided to move him back to the lab for a more extensive medical exam. After an examination of the Major’s body, it was determined that, "by all medical standards” he was dead. He had no indication of a heartbeat or respiration and yet his tissues refused to dissipate. A strange crescent-shaped wound was found on the Major’s right forearm. Another examination of the body revealed that the Major had a blood pressure of 120/80, but with no heartbeat, it was declared to be impossible. After looking at his blood in a microscope, unusual and unidentifiable cells were discovered that seemed to be resistant to destruction from human white blood cells. After the death of Dr. Alex Wyman. it was noticed that the Major’s body was missing from the examination table. The Major was soon discovered alive and was suspected by his colleagues of being somehow involved in the death of Dr. Alex Wyman. After the discovery of another crescent-shaped wound, this time on his neck, the Major was reported to have declared that "in some way, I think Dr. Wyman is influencing me. I think he may be a part of me now" and that the alien creature "didn't come here to destroy." A re-examination of Major Corcoran’s blood showed the abnormal cells had gone. 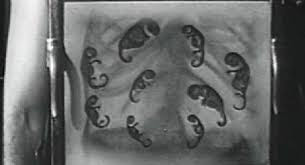 The use of a fluoroscope revealed the presence of small creatures within the major’s body. The Major appeared to have been unafraid of the alien infestation of his body and even insisted that he lead the others to the creature, as long as it was in the open and during daylight. Major Corcoran was able to sense where the Creature's lair was situated and he led the group to a ravine and a cave. After moving off from the others, the Major was overhead telling the alien creature, "I brought them to you. They don't understand. I'm not sure I do. How can I help you to communicate with us?" It became apparent to the major that the Creature had come here to conquer the Earth and that the only way to stop the invasion was for him to sacrifice his own life. After pleading with his colleagues to kill him, Major Corcoran freely chose to take his own life by means of a knife. Captain Matthews reflects on the kind of man Major Corcoran must have been. So typical of the test pilot fly-boys back in the day who seemed to be able to throw caution to the wind and fly by the seat of their pants. So different to the computer game console, joy-stick, simulation drone flying nerds these days who have to sign things in triplicate before being allowed to take a dump and then only if they double check their own bowel movement procedures. Yep, if only Matthews could feel he had just a whiff of the good ole “right stuff” instead of being a military desk-bound paper-shuffling functionary. The “Creature” reportedly needed to assimilate his brain in order to communicate with the other humans. Dr. Wyman initially entered the crashed capsule to examine Major Corcoran’s body prior to conveying the body to his lab at the radar monitoring station, where he and Dr Benson conducted further medical tests on the Major. It was Wyman who observed that Corcoran's body exhibited no signs of rigor mortis. After tests being conducted on Major Corcoran’s blood revealed that after seven hours his blood was still alive, Doctor Wyman insisted that this be reported immediately but with the radio being out there was a need to find a working telephone. Even this option, however, was to have been denied them. Without any means of contacting the outside world and with an apparently hostile creature lurking outside the lab, the base personnel decided to stay together in one room for the night with each taking a watch. While the others were asleep, Dr. Wyman appears to have been attacked by a creature. He was found strung up with half his head missing and with blood dripping on the floor below his body. Captain Matthews put the report back down on the desk and thought how this senior scientist reminded him a lot of some of the crusty old military types he served under. By means of their experience, accumulated knowledge and force of personality they somehow are able to get others to respect (and often fear) their authority. They seem to be able to issue orders effortlessly and have them carried out just as effortlessly. For those who serve or work under them, such men come to be seem as being almost like a father figure. The danger with such people is where their single-minded pursuit of a particular goal might lead those who follow them. Dave Randall and Donna Bisby were the first to arrive on the crash scene and proceeded to extinguish the flames on Major Corcoran's capsule. Randall checked the Major for a pulse, but could find none. Randall reported to his colleagues that the rocket and controls section were in one piece, but that the pilot did not survive. At the crash site, Randall noticed that the opening in the capsule was much larger than it was initially. 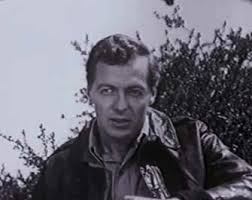 Various attempts were made by Randall to report to headquarters and to contact the Air Force on the radio, but some unknown interference kept blocking his attempts. Randall next checked the antenna and power equipment when the electrical power for the installation suddenly went out. Randall reported to the others that something had approached him and according to him, "Something hit me. It was big, like a bear. It came from out of the darkness and was heading for the lab. I know I put a couple of shots in it before I went down." It was Randall who first noticed that everyone's watches had stopped, leading to the conclusion that they were in a magnetic force field. It was also Randall along with Steve Dunlap who discovered Wyman’s body strung up. After the Creature was fired upon without any effect and was finally driven away by fire, Major Corcoran tried to convince the others that the creature should be left alone. However, Randall together with Dunlap wanted to see it killed and planned to use fire and track it down the next morning. At the site of the crash, Randall and Dunlap suspected that the Creature was inside the capsule. While leaving Donna Bisby some distance away, they discharged a flare inside the capsule. The Creature suddenly appeared and proceeded to drag Miss Bisby away. Randall and Dunlap fired at the creature which then released Miss Bisby allowing it to escape. Randall speculated that the two sources of magnetic disturbance came from both Major Corcoran and the Creature, and that it was the only thing keeping the Major alive. Although it was agreed that they would to give the creature a chance to explain its actions, and not condemn it simply because it was different, Randall and Dunlap required more than Major Corcoran’s assurances. They therefore made up some Molotov cocktail bombs to use should the Major’s plan fail and he was unable to exercise free will, as he claimed to be able to do. Captain Matthews had come across plenty of characters like Randall before. If they join up, sometimes the military sorts them out and if not, kicks them out. There’s usually something a bit reckless or gung-ho about them. Sure, they can be quite brave and decisive but such men of action can also have a tendency to act more on emotion, are quick to judge and can be somewhat vindictive when crossed or thwarted. Still, this Randall seemed to have been pretty observant and paid attention to detail. Matthews reads that he was a technician and spent most of the time joined at the hip with Randall whenever action was needed to be taken against the Creature or any running around was required. Engaged to Major Corcoran before he went up into space. Dr Benson witnessed the initial examination of Corcoran’s body at the crash site. Later examination of the Major’s body revealed to Dr Benson an abnormality in his blood consisting of a third type of blood cell. Concerning the third blood structure, Dr Benson explained to her colleagues, "That big one, that's completely foreign to any blood structure. If that bacteroid is contagious then we've all been exposed." Dr Benson later gave Corcoran an injection of sodium amytal (amobarbital) to sedate him and was given the task of guarding him, armed with a flare gun. Donna Bisby was one of the first on the scene of the crash. Miss Bisby took pictures of the crash scene. She reported that she noticed something strange about the mud in the immediate vicinity of the wreckage. 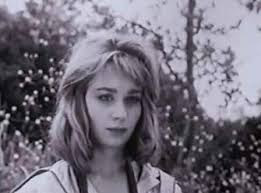 The creature later grabbed Donna Bisby when she went to the crash site with Randall and Dunlap but was released unhurt when both men shot at the creature. The creature was identified as being the extra-terrestrial entity that initially approached the base lab. While the personnel slept, Dr. Wyman was attacked and killed by the Creature. After consideration was given to the destruction of the alien embryos inside Major Corcoran, the Creature forcibly entered the lab and was fired upon without effect. Only a fire started from a thrown lantern caused it to retreat. 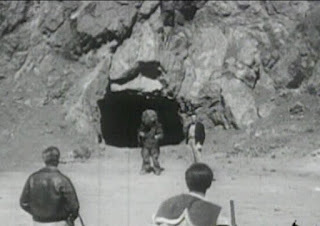 Later at the cave site, the creature using Dr. Wyman's voice, claimed that Wyman's death was a necessary sacrifice and it insisted that it was not an evil monster. It went on to explain that it wished to help give humanity a better way of life and that it had been waiting up in space to get to the Earth's surface. It also went on to claim that Corcoran was carrying within his body a new generation of its species that would soon be born. It was determined that the Creature’s mission was to conquer the Earth. Major Corcoran believed that the only way to prevent this invasion was for him to sacrifice his own life which he did by means of a knife. When the other base personnel attacked the Creature with Molotov cocktail bombs, it was reported that its last words were a warning to humanity. It was reported to have warned that, "You are not ready, but we will still save you. In your quest for self-destruction you will send up more satellites, and we will be there waiting to come again." Matthews closed the report and placed it on top of the desk in front of him. He then slumped back in his swivel chair and placed his hands behind his head and thought carefully about the folder’s contents. On the face of it, the whole episode sounded rather absurd. But the “absurd’ had become Matthews’ stock in trade for a number of years now. Here we have a creature that resembles an agglomeration of several lumps of faeces topped off with an enormous parrot's head! What was that Vulcan saying in the Star Trek series? “Infinite diversity in infinite combinations?” Well, he’d seen enough examples of that from the thousands of reports that came his way to understand how that saying was really in fact a truism! It’s only our own arrogance that stops us from understanding the truth of this. It then occurs to Matthews that the entire episode could be seen by a suspicious mind as being a cover-up for a murder. However, the people involved checked out in terms of their individual testimonies and their respective reputations, credentials and background. There’s also the matter of the substantial amount of photographic, documentary and physical evidence surrounding the incident. Before the report’s referral to the President and the Joint Chiefs of Staff, Matthews makes a copy of it which he will add to an ever-growing pile of copies of other reports that have come into his hands……. Former Captain Eugene K. Matthews sits in solitary confinement in his small prison cell at Quantico having been court-marshalled, tried and convicted by a secret military tribunal for having illegally disclosed classified government information. While the global power elites’ dogs of war were straining at their leashes, Matthews released the copies of the reports of Project HEAD to WikiLeaks which were then published in the mainstream (so-called “Fake News”) news media such as The Washington Post and The New York Times. The leaked information then went pandemic on social media. Matthews hoped that publicizing matters that would impact and even endanger the lives of everyone on the planet; matters that everyone had a right to know about; matters that should not and could not be kept secret, would force humanity to band together. Hopefully, we would realize that we are not alone in the universe and that there are greater threats to our survival than can be dreamt of in the empty paranoid minds of political leaders. Or would such knowledge cause a global upheaval, an undermining of trust in our institutions and an overturning of our scientific certainties and religious beliefs? Would chaos reign supreme? THEY have been coming here for many years and THEY will certainly come again! 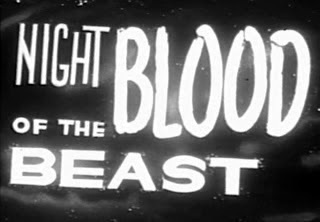 With a budget of about $68,000 and shot in seven days, Night of the Blood Beast was produced by filmmaker Roger Corman and his brother Gene. It was also one of the first films directed by Bernard L. Kowalski and was written by first-time screenwriter Martin Varno, who was then only 21 years of age. 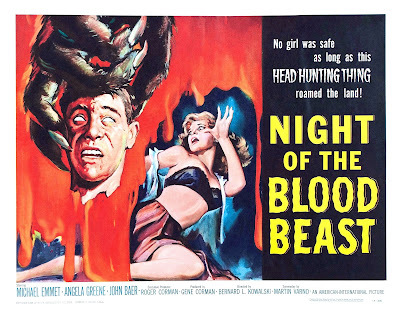 Also known as The Creature from Galaxy 27 & The Monster from Galaxy 27, Night of the Blood Beast was released as part of a double-feature with Roger Corman's She Gods of Shark Reef (1958). 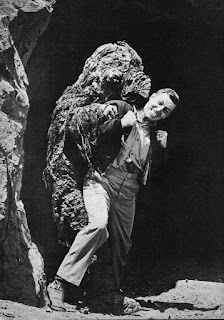 The alien-creature costume used in the film would later be used in, Teenage Cave Man (1958) with Ross Sturlin once again portraying the monster. 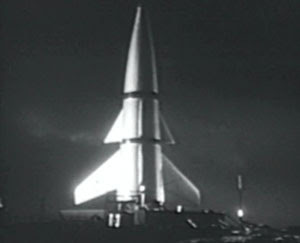 The story was somewhat influenced by the then contemporary Space Race and the Howard Hawks film, The Thing from Another World (1951). It seems that this film together with IT, The Terror From Beyond Space (1958) prefigured the premise of the later Alien (1979) film. There are the usual quota of scientific technobabble and scientifically implausible explanations such as when the character, Major Corcoran is described as having no heartbeat and no respiration, but he does have blood pressure. However, there is no way to determine blood pressure without a heartbeat! Despite its faults, it is a reasonably well-made tense, claustrophobic and moody film. It also moves along at quite a brisk and steady pace and the acting is fairly competent and sincere. Night of the Blood Beast explores the theme of difference and how our perceptions of someone or something can be determined by something as superficial as appearance. For instance, how the human characters in the film consider the creature as being the embodiment of evil because it is different. Major Corcoran attempts to defend the creature thus raising the point that because someone or something is perceived to be ugly or different does not necessarily make that person or thing evil. But nothing in life is completely clear cut or black and white and the question remains as to the true nature of the creature who claims it wishes to save us from ourselves by invading the Earth.